The underground, cozy Mangosteen Wine Cellar is a unique feature in Phuket. Two flights of stairs down and guests have the feeling to be somewhere in the Bordeaux region or maybe in Tuscany. The wine racks feature a large variety of labels from all over the world. French, Italian, Australian, New Zealand, Austrian, Chilean, Spanish and Argentinian wines are kept at ideal temperature and humidity and offered through our extensive wine list. We feature some famous labels, for example Molly Dooker wines from Australia or GranMonte wines from Khao Yai, Thailand, only available in a few selected top restaurants. Wine tastings, Wine dinners and gatherings from two to eight people are arranged here. It is a perfect spot for a romantic candle light diner for two as well. Please ask our team to arrange your personal wine cellar evening. GranMonte Thai Wines! A wide selection of the best of the best from Asoke Valley, Khao Yai. Franz Haas, “Manna”, Riesling, Chardonnay, Sauvignon, Traminer Grapes, Organic and super delicious. One of the best from Südtirol. Barolo Cannubi, Marchesi die Barolo, Piedmont – a famous classic! Gianfranco “ES”, Primitivo, Puglia, 16.5%, Amarone of Southern Italy, 3 times best Italian Wine in a row! Our team will be happy to help you finding your favorite wine, best matching your food choices. The menu. Phuket’s most romantic, private dinner location – The Mangosteen Wine Cellar! Reserve your private space in our exclusive, underground Wine Cellar and enjoy a Gourmet Dinner in total privacy. 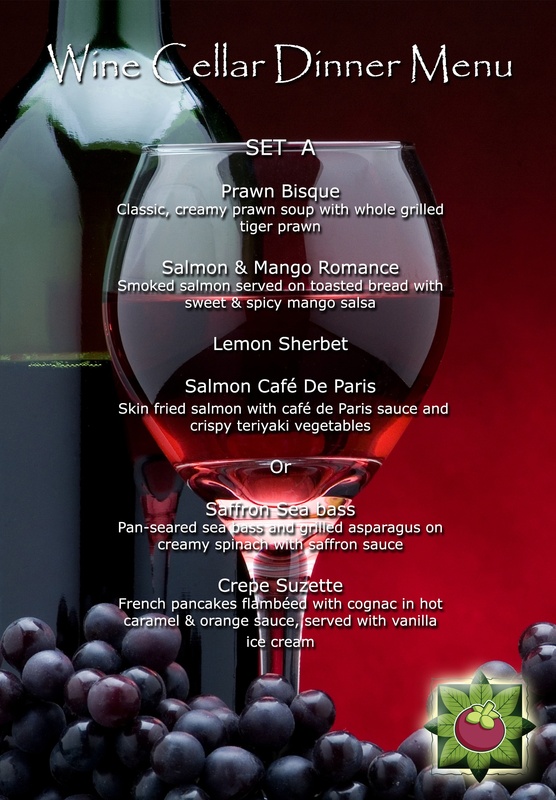 Phuket’s most Romantic Dinner for Couples (Set A or B, minimum 2 person) or small groups up to maximum 8 person inclusive half a bottle of House Wine (White, Rose or Red) p.p., coffee or tea. Perfect for couples in love, anniversaries, birthdays, proposals, honeymooners or without any reason (just spoil yourself). 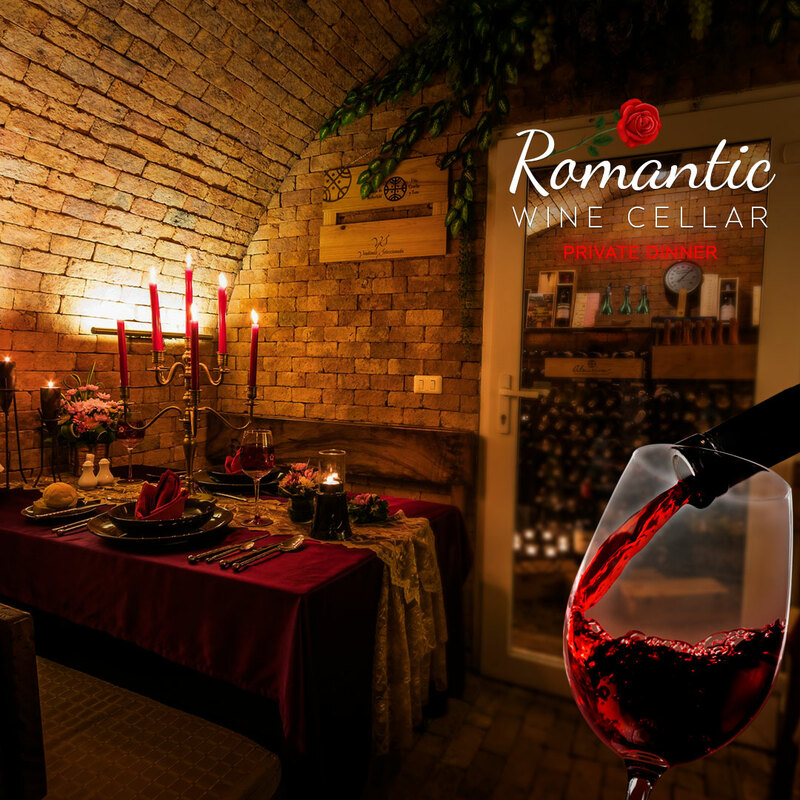 Total privacy, romantic setting and delicious food in our unique underground Wine Cellar. Only THB 2.800 per person, including half bottle of house wine (can be upgraded), service charge and tax. 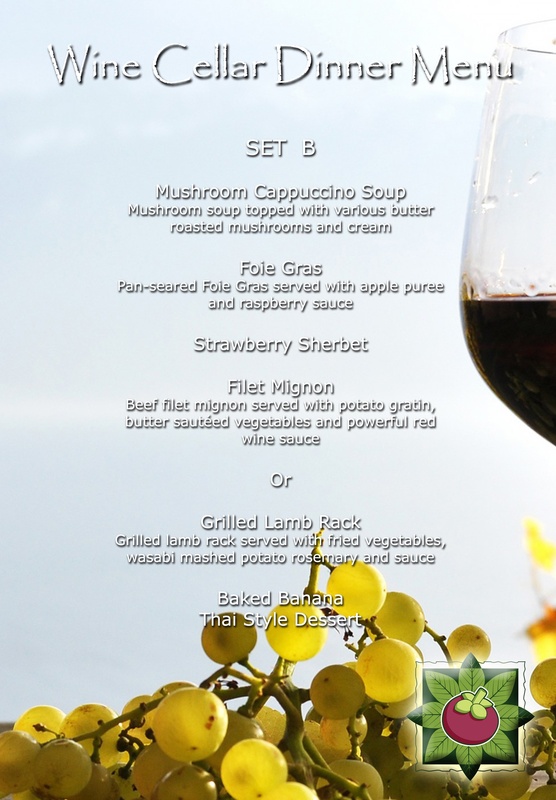 Reserve Wine Cellar Dinner now!